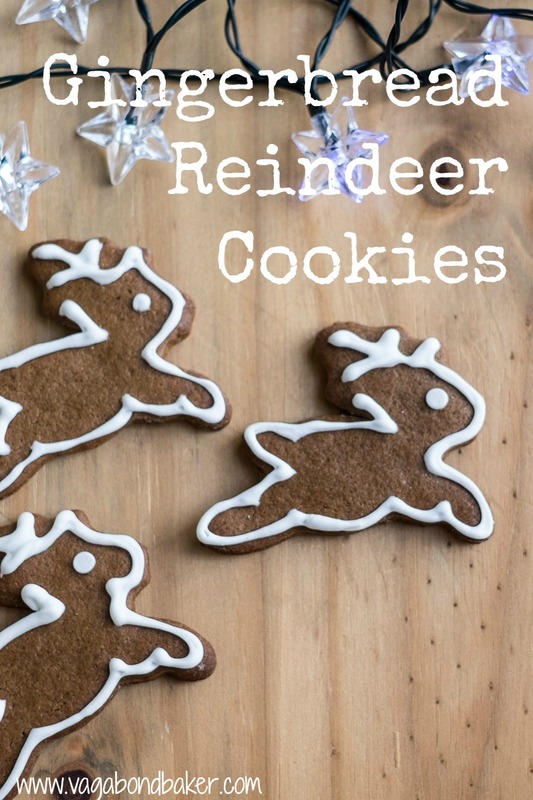 Would you believe it if I said that the only reason I made reindeer gingerbread cookies was that I wanted to make an animation of them leaping? Um, well that is precisely why I popped into town the other day and hunted down a reindeer cutter. Isn’t it just the cutest shape? My original inspiration actually came from something much more traditional: a wooden tray of festive gingerbread cookies in a museum bakery in Sweden last year. This was in the Skansen outdoor museum in Stockholm, and I nibbled on a gingerbread reindeer while I wandered around the festive historic village. This particular reindeer wasn’t quite as cute as these, it was a more angular, yet it was wonderfully spiced and rich with treacly goodness. It was that treacly-ness that I was hankering for, and as I always have a tin of black treacle in the cupboard for baking my favourite rye bread recipe, I didn’t need to venture out to the supermarket – which with this never-ending December rain was a good thing! 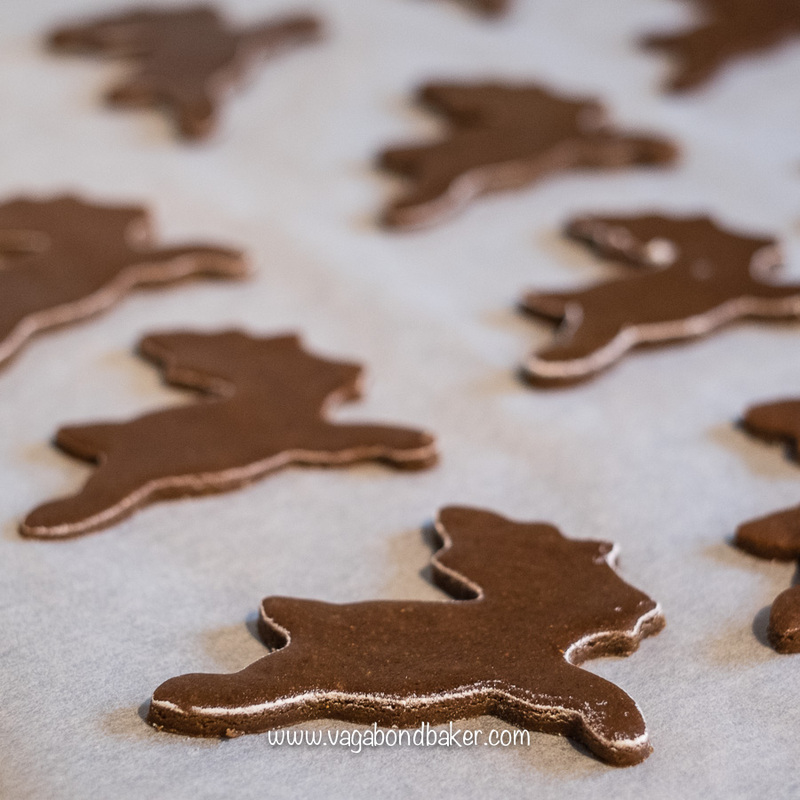 I used altered a Finnish recipe for gingerbread cookies, mainly because I’d come across the recipe –well, the photos – a few days beforehand: Pinterest offering me them. It had a good dose of dark syrup, which I lessened a little to soften the treacle taste as black treacle can be somewhat overpowering and I’m not entirely sure how Finnish syrup and black treacle match up against each other. 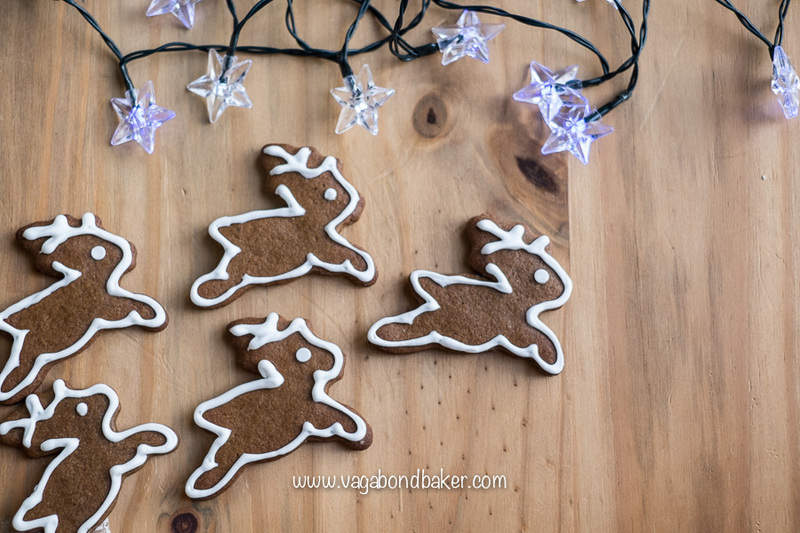 Enjoy the continual leaps of these spiced cookies, it was a fun bit of artistic baking inspiration! 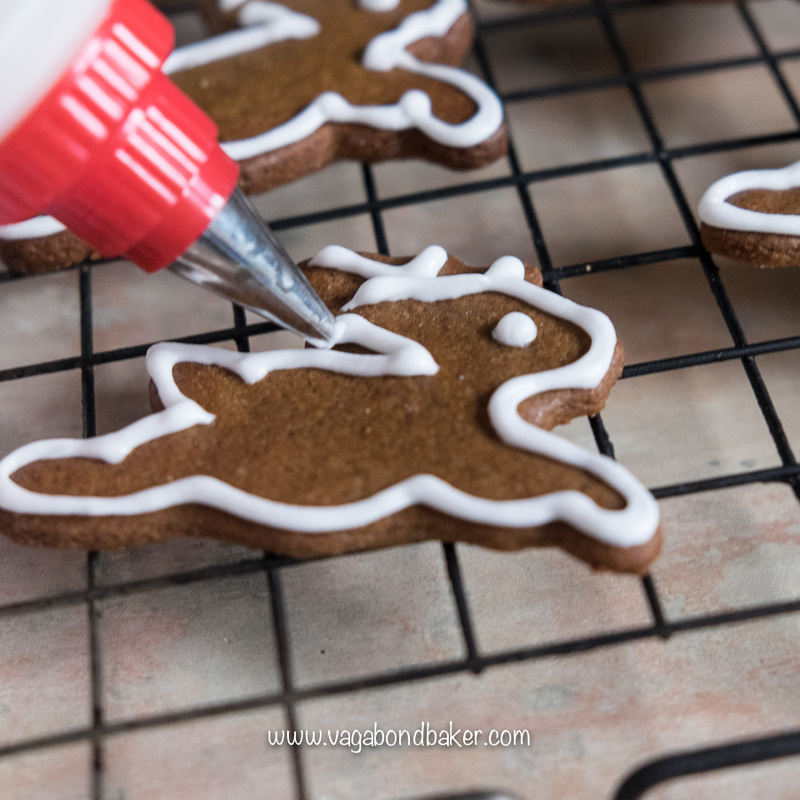 Obviously, I’ve used a reindeer cookie cutter but any festive cutter will do! This recipe is adapted from Kinuskikissa’s Isot Piparit Lumihiutalemuotilla (big gingerbread snowflake cookies- the recipe is in Finnish). Chop the soft butter into a mixing bowl and add the sugar. Heat the black treacle to a boil (I did this in a microwave, it happens very quickly so don’t wander off!). Pour the hot treacle over the butter and sugar. Beat everything together then add the egg and the orange zest and beat again. Thoroughly combine all the dry ingredients. Add it bit by by bit to the syrupy batter until it becomes fairly stiff. Bring it together with your hands, if should feel a bit too soft to roll just yet. Wrap the dough in clingfilm and refrigerate to harden up, preferably overnight. Preheat the oven to 190º C and line a baking sheet (or two) with baking parchment. Remove the dough from the fridge and half it, rewrapping one half and returning it to the fridge. Roll out the other half of the dough between two sheets of baking parchment to a thickness of a pound coin. Stamp out the cookies, re-rolling the dough until it’s all used up. Transfer to the prepared baking sheet(s), you can put them fairly close together as they don’t really spread. Bake for around 7 to 10 minutes, use a palette knife or spatula to transfer the cooked cookies to a wire rack to crisp up and harden. Beat the egg white until smooth in a large bowl. Sift in a little of the icing sugar and beat in with an electric mixer, add the lemon juice. Keep adding the icing sugar bit by bit until the icing leaves a trail that doesn’t sink back into the icing when you lift the beaters. Transfer the icing to a piping bag fitted with a small plain nozzle. Ice on your designs then leave aside for the icing to harden up. As you can see, they go perfectly with a cup of mulled wine/ glühwein / glögg! 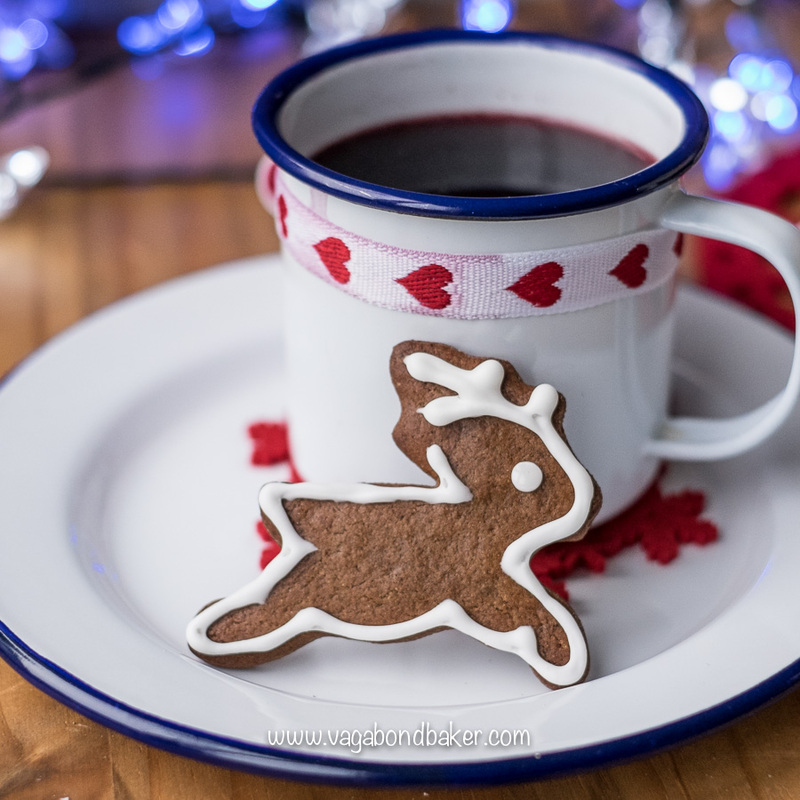 Glögi / Glögg: The Most Delicious Mulled Wine Of All Winter drinks don’t get more festive than glögg / glögi. Why Mürren Is A Fairytale Winter Wonderland: Like finding yourself on top of a Christmas cake, so perfect! Finding Christmas in Northern Europe From Germany to Finland, and everything festive in-between! Two Little Alpine Christmas Markets Heading into the Swiss Alps! Festive White Chocolates Easy christmas treats that look so pretty. These are gorgeous, I know what we will be doing this weekend now! Thanks Suz! Happy festive baking!